Was this gobsmacking, though? Did the blokes from the Eye bother to do any number crunching to determine just how surprising it was that a woman chair would select three women as winners? For one thing, the chair in question is just one of five judges – and the 2016 panel included two men. They choose three winners each year (in different categories). How much is Private Eye willing to ignore the contributions of the four other judges, none of whom are women from “Caribbean parentage”? If we look at the lists of past winners and past judges/chairs, we can do some analysis. If we look for panels which awarded prizes to poets of a single gender, there have been three all-male winner lists (1994, 2001 and 2003) and two all-women winner lists (2016 and 2015). The two all-women lists were chosen by female chairs, but 2/3rds of the all-male lists were chosen by female chairs, too. TL;DR: women are just as likely to choose all-male winners as all-female. Men have never chosen all-women winners (women have done this twice). 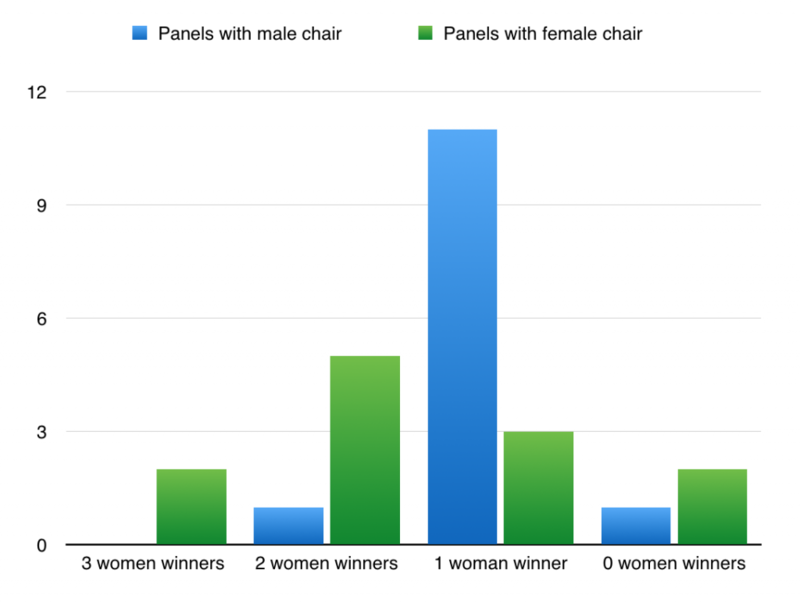 … whereas the male chairs massively skew towards a 66% male selection of winners. TL;DR: men tend to choose other men to win this prize. Women are much more likely to pick a mixture of genders. Finally, to the Eye’s dogwhistle-like mention of the racial origins of the winners this year. Well, life’s too short to compute the birthplaces of 75 poets (and it looks like the Tories are about to make this compulsory soon anyway), but it’s curious that they don’t mention this for the other years where it’s probable that there was overlap in the countries of birth of the judges/winners. The fact they bring it up at all suggests they think that either a) there’s something suspicious about people from the Caribbean winning an award based on merit or b) there’s an objective “winner” in poetry prizes that will always be selected by any panel of judges, regardless of their interests, origins or reading habits. Either way, this is shoddy journalism. The data tells us that it’s more unusual for women chairs to pick all-women winners for the Forward prize, and that the only consistent pattern—if any—is for male chairs to pick majority-male winners. That is the scandal the Eye should be complaining about. Bookmark this article's permalink. RSS feed for this post.